The Association of American Railroads (AAR) has promulgated a new Rule 46 in the Field Manual of the AAR Interchange Rules. This new rule represents a comprehensive effort to codify under one umbrella many of the formerly fragmented rules dealing with truck wear limits, maintenance criteria and inspection standards. Specifically, for the first time there are now condemning limits for friction casting (wedge) rise above the top of the bolster when a car is on a repair track. As explained in earlier Interface articles in dealing with truck warp, harmonic rock and roll, and truck hunting, friction casting wedge rise can be a critical factor in poor truck performance. When friction castings rise to a certain limit above the top of the bolster, it is an indication that the sacrificial wear surfaces have worn to an extreme condition. In this condition, truck damping and truck warp restraint are severely degraded. Prior to Rule 46, the only AAR standards that addressed wedge rise were found in Rule 88, which was typically applied when cars were going through major maintenance overhauls. If excessive wedge rise was spotted when a car was on a repair track for routine maintenance, such as brake shoe replacement, there was no mechanism to force repair of the friction castings, or to specify billing procedures. The new Rule 46 should go a long way toward improving truck performance in dynamic regimes by allowing earlier detection of impending truck damping performance issues. When reviewing the new Rule 46, bear in mind that there are two distinct sections. Section 1 presents standards and condemning limits for a car “at any time.” This means that any time a mechanical inspection reveals that one of the condemning limits is exceeded, repairs can be made and billed to the car owner. For instance, if during an outbound inspection in a yard track a condemnable situation is observed, the car can be moved to a repair track for remediation and repair. Section 2 presents standards and condemning limits when a car “is on a repair track for any reason.” This means that a car must first be on a repair track for these standards to take effect. Section 1 of Rule 46 provides clear guidelines for determining when a friction casting is condemnable due to wear on its friction face (front face). Rule 46 now outlines specific inspection locations and visual wear indicators for nearly every type of friction casting that is produced. Figures A-H (of the Rule) show specific wear limits for conventional steel wedges and the newer split wedges. Figure 1 shows the limits for conventional Ride Control trucks; Figure 2 shows the limits for various designs of the Barber style truck. Figures I – K (of the Rule) show wear limits for wedges equipped with resilient friction wear elements on the back slope surface. 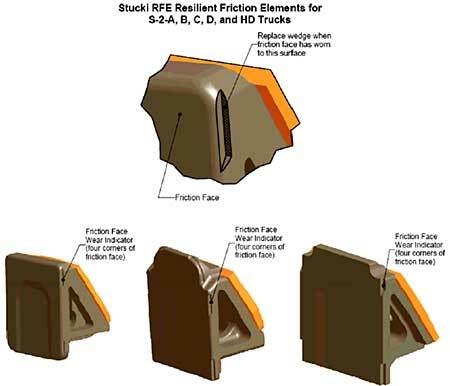 Figure 3 shows wear limits for the Stucki Resilient Friction Elements (RFE) used on Barber style trucks. — Truck side friction casting wear plate is missing, broken or loose. — Bolster wear plate is missing, broken or loose. — Vertical clearance between the truck bolster center plate rim and the body center plate is less than 1/16 inches at any locations. — The difference in the diameters of body center plate and truck bolster bowl at the same location exceeds 1-3/8 inches. — Body Center plate bowl or truck bolster bowl is worn to limits shown in Table 1 (see Figure 4). — Truck is detected by a truck hunting detector exceeding certain thresholds (see Rule 46 for more detail). — The truck side frame casting wear plate is worn to a thickness of less than 1/4 inch in any area. When the column wear plates begin to wear, or become dished and hollowed, they will allow greater wedge rise. In extreme cases, this could cause toe-in on the plates, increasing the possibility of bolster lock up. — The bolster wear plate is worn 50% or more from its new condition, as observed when the truck is dismantled for other cause. (Note that the truck must be dismantled for these measurements to be done and for this criteria to take effect). — The friction casting wedge rise height (measured by an approved method) exceeds the limits indicated in Figures A-1, A-2, A-3, B-1, C-1, D-1 (of the Rule), or if wedge rise exceeds the manufacturer’s recommendations. Figure 5 shows the correct method to check wedge rise for a Ride Control truck; Figure 6 shows the correct method for a Barber style truck. — More than 25% of the material (or as recommended by the manufacturer) is missing on an individual friction shoe (casting) equipped with friction or composition materials. — Column guides and gib clearance are at or exceed the wear limits in Table 2 (see Figure 7). Worn gibs are primarily an indicator of truck instability — particularly with regard to truck hunting at high speeds. When gib wear becomes excessive, it can lead to greater warp angles, and the potential for the truck bolster to become off-center, resulting in jackknifing tendencies under extreme buff loads. — Mismatched side frames: Mate side frame mismatch is not greater that one button; with mate side frame wheel base nominal dimensions to match. Buttons are used on side frames to indicate slight tolerances in the desired axle center length of the side frame. Each button represents approximately 3/64 inches of tolerance. A truck frame that is measured to be precisely 70 inches for a 100-ton truck would have three buttons. If the truck frame was 3/16 inches too short, it would have two buttons; if it was 3/64 inches too long, it would have four buttons. Testing and research have shown that trucks with even one button mismatch do not perform as well in curving and stability as trucks with a precise button match. However, the AAR has determined that a one-button mismatch is sufficient to provide for acceptable performance. — Vertical clearance between the truck bolster center bowl rim and the body plate is less than 1/8 inches at any location. When a car is on the repair track, any clearance between the bowl rim and the body center plate that is less than 1/8 inches is condemnable, whereas, in the train yard the clearance must be less than 1/16 inches to be condemnable. Inadequate clearance between the bowl rim and the bolster results in fouling between the surfaces, and changes the center of rotation of the centerplate from the center of the bowl to the outer edge of the bowl rim. This greatly increases truck turning resistance, resulting in the possibility of warped trucks. Additional provisions of Rule 46 deal with correct repair procedures, centerbowl lubrication and billing repair card requirements. There are many more details, measurements and specifications in the complete Rule 46. This article, which is not meant to supplant or interpret the meaning of the rule, provides only a summary of the major provisions. In total, Rule 46 should go a long way toward improving the performance of freight car trucks, which should reduce fuel consumption, wheel and rail wear rates, tie degradation and the risk of derailment.